The Aussie and Euro dip after China non-manufacturing PMI and ahead of US jobs report. As a result, risk currencies stay in tight range. Early Friday, the Euro and the Australian Dollar both struggled to make much headway in Asia. This was due to the fact that a dip in Chinese non-manufacturing data weighed on sentiment, prompting traders to lighten positions in risk currencies, while awaiting also a key jobs report in the United States. This shows that risk currencies will likely stay in fairly tight ranges ahead of the jobs reports later in the day. The Euro was barely changed, as investors are also awaiting the outcome of talks between Greece and its private creditors. The talks centre on the so-called private sector involvement deal (PSI). For the last few days Greek officials have repeatedly said that a deal is around the corner. Olli Rehn, the European Union Economic and Monetary Affairs Commissioner, also reiterated on Thursday that it could be agreed to by the end of this week. Many analysts expect a short spike to occur on news of the deal being agreed to. However, the sentiment is that any euphoria will be short lived and the focus then will shift to whether the whole package will slot into place well in time for the March 20th bond-redemption deadline. Traders have also remained very wary of possible intervention to weaken the Yen by Japan. Japanese Finance Minister, Jun Azumi, said today that speculative Yen buying had gathered momentum since last week. He repeated that he was ready to act decisively to counter “one-sided” moves. The U.S Dollar meanwhile, has come under renewed pressure. This has been the case since the Federal Reserve last week pledged to keep interest rates low for longer. This in turn, makes it attractive for investors to use the greenback as a funding currency for carry trades. On Thursday, Fed Chairman Ben Bernanke testified before congress and said that Europe’s financial crisis still threatened the U.S. recovery and that the central bank would do everything it could to ward off damage. Bernanke said he was seeing signs that some of the factors dampening U.S. business investment, including uncertainty surrounding European bank woes, might be waning. But he kept the option of further easing on the table. At 13:30 GMT the highly anticipated U.S. jobs report is due. The non-farm payrolls data is expected to show the U.S. economy generated 150,000 jobs in January and that the unemployment rate has kept steady at 8.5 percent. It’s a possible “no-win” situation for the greenback, as any upside surprise would boost risk sentiment further, but any disappointment could also strengthen the case for more stimulus from the Fed. The Euro touched an intraday low of $1.3114, while the Aussie nudged down 0.2 percent to $1.0692. The Dollar bought 76.21 Yen, near a record low around 75.31 Yen set on 31st October 2011 when Japan intervened. The Euro was slightly lower in Asia on Friday ahead of the unemployment report due in the United States later on today. Investors were also awaiting the outcome of talks between Greece and its private creditors on a debt swap deal. Greek officials insist that a deal is on the cards, and many analysts agree that we could see this take place by the end of the week. There are no High Impact News Releases scheduled for the Euro or Yen currency pairs today but traders will eye Euro consumer spending data (Retail Sales). Remember, the US Non Farm Payroll data will also be released today so if you are in any positions it would be wise to tighten your stops or exit altogether. Looking at the chart image below, we can see that the price has been contained within a triangle pattern. This helps us see that the price range is narrowing as it approaches the apex of the triangle. In this scenario, we could look for a breakout of the dashed trend lines in either direction. But be wary of false breakouts! At this moment in time, the bearish channel holds firm yet my system suggests there might be a bullish signal lining up. However, I am reluctant to look for entries with the NFP data due in a few hours and the markets set to close at the end of the day. Better safe than sorry folks, remember trading is a game of patience. It’s always better to hold on to what you have and live to fight another day. So we will continue the good fight next week. Until then, all the best! After hitting R2 on Wednesday, the Gbp/Usd has gone sideways and has been trapped between R1 and R2. We have bullish hidden divergence at the moment on the 4 hour charts that has signaled a buy entry however the Daily charts are still very much oversold and the indicators are starting to lose momentum. 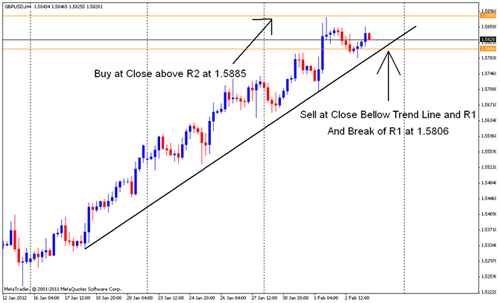 I’m looking for either a sell at a close below R1 and a break of the trend line or a buy at a close above R2 at 15885. There are several news releases due out today for the USD that are high impact in nature. Strategy – As this might be a short-term top, target short position. Tactics – Taking light short positions below 1.3075. If not in a position stay flat. 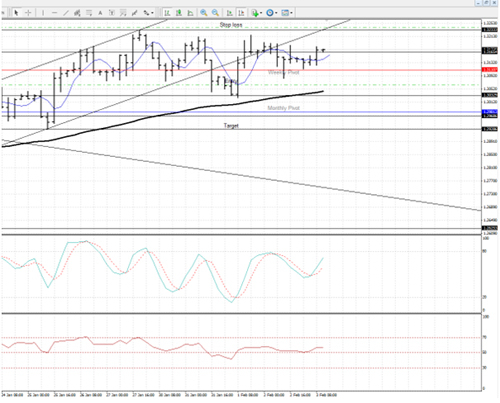 Short at 1.3065, with stop at 1.3241 and take profit at 1.2929. Added a pending long order at 1.3241 (same as stop) with a target of 1.3302. Still short and market remains pretty much the same as yesterday with sideways trading in anticipation of the non farm payroll release at 8:30 EST. We could remove the stop in case a spike takes us out but it is always safer to take the loss as the next trade is just around the corner. A 4 hour close after NFP above 1.3233 could lead to the next leg up. I have set a long order at 1.3241 and an exit order at 1.3302. No stop for the long order as I want to see the action after NFP. If we continue the downtrend I will cancel the order.